I remember well the first time I heard the debut album from Liquid Tension Experiment. An explosive wall of sound fizzing with life, carrying a high energy surge of technical musical brilliance and delivering insane levels of innovative artistry at a breathless, breakneck speed. The sheer power and vitality of the music snapped your head back and kept you utterly and completely transfixed from start to finish. Rarely has a record caught my attention in quite the same way. An arresting guitar riff erupts over dazzling staccato power chords and a frenetic, throbbing drum rhythm kicks in to open the doors to Touch and Go, a song positively dripping with creative excitement, frenzied purpose and no small sprinkling of sheer breathtaking virtuosity. 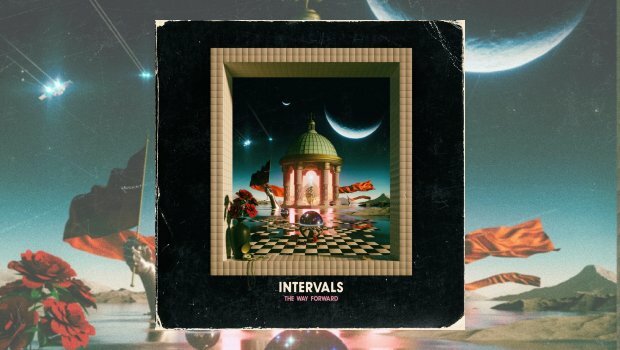 Aaron Marshall’s third studio album as part of the Intervals projects grabs your attention with a joyful, smiling wide-eyed intensity and simply refuses to let you go. A fresh, challenging, triumphant spirit permeates and soaks through every chord and every note; make no mistake, you can both hear and feel the pulsating spark of disciplined and controlled happiness resonating in and through every track this album has to offer. Such a dramatic and thrilling opening needs the confidence and the courage of its convictions to drive such an impressive statement of intent. The Way Forward lacks for neither. Building on the core musical foundations established in The Shape of Colour (2015), the new release is an impressive and, in places, exciting evolution of the ideas, themes and soundscapes found in previous releases. In this respect, Touch and Go serves as a gateway which admirably consolidates what has gone before whilst laying out the groundwork for the new directions about to be taken. Although focus firmly remains on the sheer passion and blazing brilliance of the guitar driven heart of this sizzling instrumental prog, Marshall now cradles it in a more embracing set of soundscapes, each laced with catchy hooks and evocative riffs. What is immediately noticeable is a much greater degree of complexity in the song writing and more detailed intricacy in both the playing of the lead instruments as well as in the ways in which they interact with each other. A Different Light opens with a light, airy, almost playful riff which is then cheerfully mirrored and echoed through a bewildering series of fascinating variations and thoroughly enjoyable contrasts. Rubicon Artist uses a series of stuttering, shuddering chords and delightfully complex and elevated drum beats to dart from sequence to sequence, never resting, always in motion, carrying you forward. In turn these highlight the way in which the songs have been carefully crafted and tightly constructed by weaving textures and interactions into each other and slowly building lavish layers to carry the main themes and tunes. By Far and Away is a wonderfully bluesy, (relatively) laid back arrangement which builds and segues between enchanting arrays of melodic moments. Likewise Belvedere gently weaves a variety of slow forming layers to reach a fully amplified crescendo bound tightly by some brilliantly magical guitar work. The blistering pace and natural momentum of the music does not signal a lack of subtlety or diversity. The remarkably beautiful and hauntingly delicate The Waterfront with its distant echoed opening guitar refrain is ample evidence, if any is needed, of the ways in which Marshall brings significant depth and reflective appeal to the song writing. There is a yearning thoughtfulness and almost sad remembrance of things past which seems to hang in the chords and the passages of transition throughout the song. By the time you reach the final song there is a feeling akin to having been on a roller coaster ride. As the carriages come to a halt and the experience ceases to be all consuming and gradually begins to dissipate, there is a breathless feeling of both intoxication as well as a satisfying sense of exhaustion. The Way Forward is an engrossing, fiery cauldron of musical inventiveness, spectacular musicianship and boundless vitality. Thoroughly enjoyable and well, well worth a listen.